WHAT IS THE UNION STATION HOLIDAY MARKET? The Union Station Holiday Market is curated and produced by the Denver Flea and hosted by Denver Union Station. The Holiday Market features four weekends of shopping, festivities and winter fun, all at the historic Denver Union Station! Starting on November 23 (Black Friday), 100s of Colorado’s best makers and artisan brands will pack the Plaza of Union Station each weekend for a holiday shopping wonderland in the heart of Mile High, paired with music, eats, drinks and more. WHEN AND WHERE IS THE UNION STATION HOLIDAY MARKET? This holiday shopping wonderland is happening OUTSIDE on the plaza of Denver Union Station at 1701 Wynkoop St. Denver, CO 80202 in Downtown Denver. WEEKEND ONE: Friday, November 23 from 4-9 p.m. | Saturday, November 24 from 10 a.m.-6 p.m. | Sunday, November 25 from 10 a.m.-5 p.m. WEEKEND TWO: Friday, November 30 from 5-9 p.m. | Saturday, December 1 from 10 a.m.-6 p.m. | Sunday, December 2 from 10 a.m.-5 p.m. WEEKEND THREE: Friday, December 7 from 5-9 p.m. | Saturday, December 8 from 10 a.m.-6 p.m. | Sunday, December 9 from 10 a.m.-5 p.m. WEEKEND FOUR: Friday, December 14 from 5-9 p.m. | Saturday, December 15 from 10 a.m.-6 p.m. | Sunday, December 16 from 10 a.m.-5 p.m.
WHAT TYPE OF VENDORS WILL BE AT THE MARKET? Each weekend, we’ll have a rotating selection of 130 local and regional vendors, selling a variety of products sure to please EVERYONE on your holiday gifting list! You can check out all of the Holiday Market vendors and the list of vendors for each weekend on our Maker page here. TELL ME MORE ABOUT THE TICKET SITUATION! CAN I BUY ONLINE OR AT THE DOOR ONLY? Tickets are $5 and good for entry/re-entry for the specific weekend for which they are purchased. Children 12 and under are free. You can purchase them here. Tickets are available for purchase at the same price - but we encourage you to buy them online in advance to skip the lines! what else can I do besides shopping? We’ve got plenty of festivities and activities for you to enjoy while at the Holiday Market! To name a few, we have a stellar live music lineup with different local bands each day, delicious seasonal cocktails and hot drinks to sip on, and a comfy heated lounge by SixPenny to relax in. Inside Union Station, you can grab a bite or a drink from Mercantile, Terminal Bar, Stoic & Genuine, Cooper Lounge and other F&B spots, as well as say hello to Santa on Sundays! WHY DO IS THERE A $5 FEE TO attend THE MARKET? The $5 entrance fee goes towards infrastructure, security, entertainment and other production costs associated with hosting a four weekend event, the goal of which is to provide vendors and attendees alike with a unique shopping experience. Additionally, the Denver Flea reinvests a significant portion of the fee into RMMFI, a non profit micro loan program which directly supports many of the vendors you can visit at the Union Station Holiday Market. what about parking near union station? Limited parking is available near Union Station via paid parking lots and metered street parking, so we suggest calling a Lyft Shared Ride. 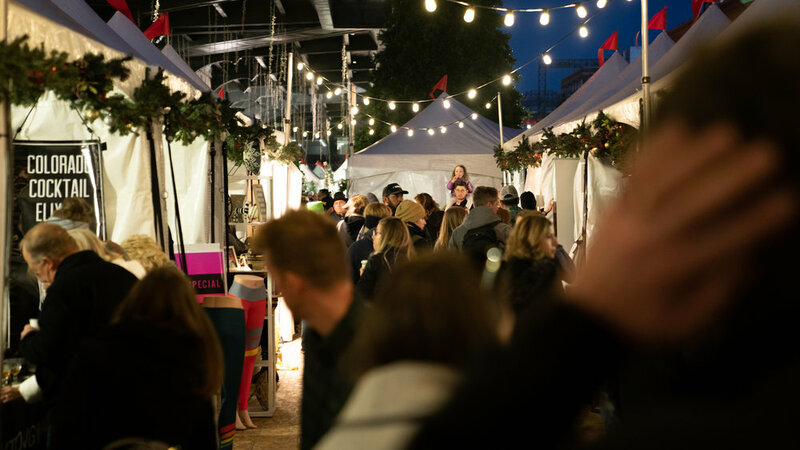 Use code HOLIDAYFLEA2018 for 20% off one Shared Lyft ride (up to $3), to or from the Union Station Holiday Market all weekend. You can also take the RTD A or B line, MetroBus or Mallride directly to the action at Union Station. Since we live in Colorado and the Holiday Market is in fact, outside, be sure to don your finest - and warmest - winter layers to stay cozy while you’re perusing the booths! why is the market outside? The Union Station Holiday Market is held outside on the Plaza of Denver Union Station to create a traditional winter holiday market similar to those found at Bryant Park in NYC and across Europe during this time of year. We love dogs, however, because of the crowds, we do not encourage you to bring them. WHERE EXACTLY IS THE MARKET wITHIN UNION STATION? The festivities are all happening on the Plaza! Check out our handy-dandy map below!